For moms and little ones constantly on the go, the car seat is a saving grace. Although it may seem like all car seats function the same way, this isn’t the case. Each car seat has its own key features and unique safety checks. That being said, there are a few, universal baby car seat safety checks you can perform before hitting the road to ensure your whole family arrives to your destination safely! It can be confusing to determine which way your baby’s car seat should face. According to the Centers for Disease Control and Prevention, your baby’s car seat should be rear-facing until your little one is two years old, or until he or she has exceeded the height and weight limit designated for their specific rear-facing car seat. As your child grows, there are different types of car seats and booster seats to accommodate them. Buckling your baby into his or her car seat requires attention to detail. Make sure every strap has been tightly secured before moving into the driver’s seat and getting on the road. Your child should fit in the seat tightly, but comfortably. Check how much wriggle room your child has before every ride; even a harness that fit perfectly the last time you used the seat could have loosened slightly, decreasing its effectiveness. Not sure if you’ve checked every strap? Each car seat comes with a dedicated manual to help parents become experts at keeping their baby safe when traveling on the road. Keep that manual handy so you can reference it whenever you want to double check the specific strap guidelines for your baby’s car seat. Car seat installations can be a tricky process, which is why there are experts available to help ensure your specific seat is fitted for your vehicle. Typically, these checks are hosted by a representative at your local government’s office, or by child safety organizations such as Safe Kids. Check out when the next baby car seat safety check is occurring in your area! 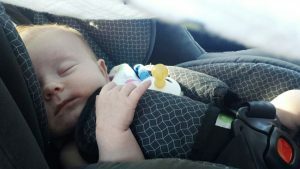 When used properly, a car seat is a life saving device for our favorite road trip companions, our kids! Use these baby car seat safety checks to make sure your little one has a safe ride, every time.